The species richness of four major taxonomic groups of vertebrates (amphibians, reptiles, mammals, and birds) is illustrated by Figures 7.8-7.11. The maps were compiled by Zlotin and Yasny (1992) using the method of coincidence mapping for a grid of 100 x 100 km. Maps of amphibian (Figure 7.8) and reptile (Figure 7.9) diversity were compiled using a monograph by Bannikov et al. 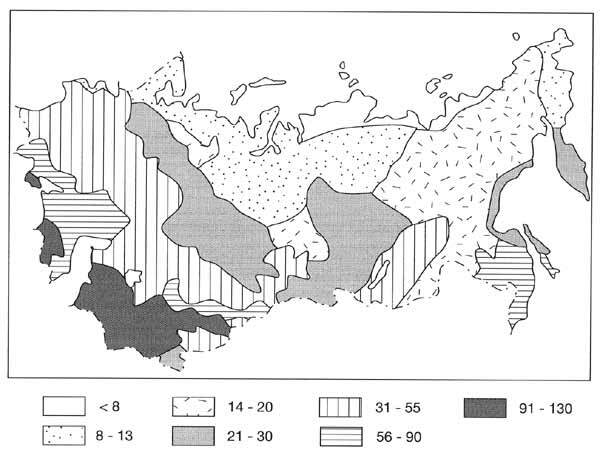 (1977), which presents areas of distribution of all 27 species of amphibians and 75 species of lizards, snakes, and turtles across Northern Eurasia. Maps of distribution of mammals and birds are based on the data of Flint et al. (1967, 1970). Amphibians, which require a warm and moist climate, are relatively few throughout the region primarily due to low temperatures. Maximum diversity of amphibians occurs in the Caucasus and in the Far East, where eight to nine species are found (Figure 7.8). 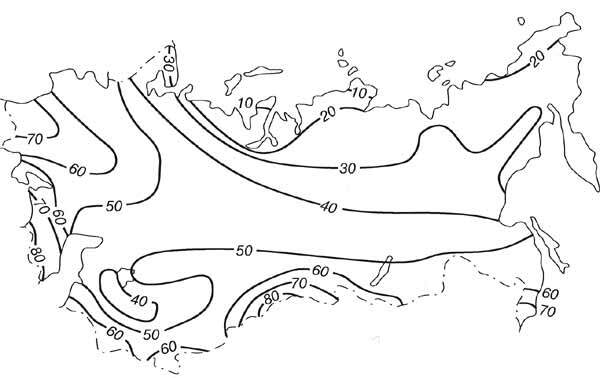 These two regions served as refugia for amphibians during the Pleistocene glaciations and are likely to be secondary centres of origin for this taxonomic group in the paleoarctic realm. 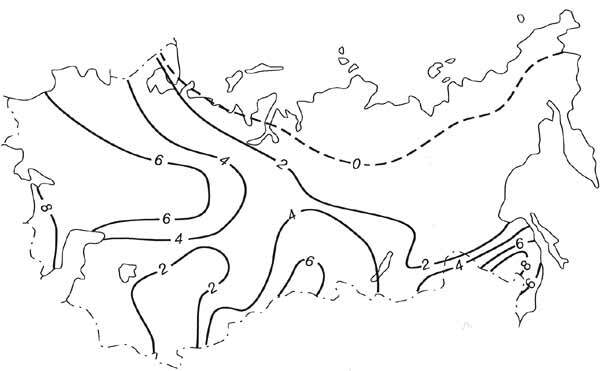 The pattern of diversity of reptiles (Figure 7.9) closely follows the pattern of heat supply: the number of species increases southward and reaches its maximum of fifty species south of the Aral Sea. 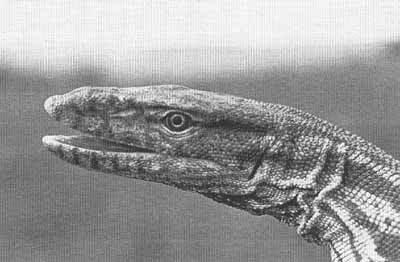 There are no other centres in Northern Eurasia with the same diversity of reptiles. In the two other centres of biodiversity, the Caucasus and the Far East, the number of species is three times less. Due to the long isolation of the region in the past, their favourable warm, dry climate, and their high diversity of habitats, the deserts and semi-deserts of Central Asia, and particularly of Turkmenistan, are an important centre of origin and evolution of reptile species. Twenty-five per cent of all reptile species are endemic, for example, some species of toad-headed agama (Phrynocephalus), lidless skink (Ablepharus), and desert monitor (Varanus griseus) (Plate 7.1). Distributions of two taxonomic groups of homoeothermic vertebrates, mammals and birds, are closely related (Figures 7.10 and 7.11). Unlike amphibians and reptiles, species of birds and mammals are distributed rather uniformly across the region. The southward increase in the number of species is gradual, indicating a relatively low importance of the climatic factor for the diversity of higher homoeothermic groups. 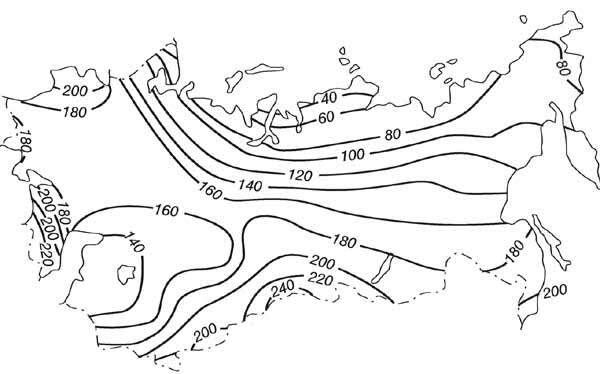 Flat topography favours the migration of species across the East European and West Siberian plains. The Caucasus, mountains of Central Asia, and the Far East are characterized by higher diversity and a relatively high level of endemism, although the maximum is less pronounced than the maximum in the distribution of amphibian and reptile species. The share of rare and endangered species of animals is relatively high across the region and with respect to vertebrate species it constitutes 20-40 per cent of the total number. This is indicative of a potential threat to the existence of the rare species due to predicted changes in climate and intensified land use. 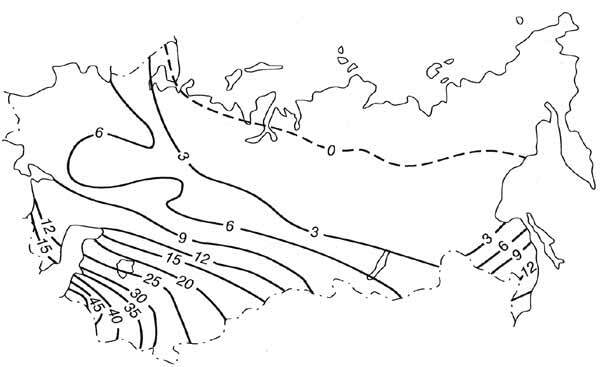 Figure 7.12 illustrates the distribution of rare vertebrates. The share of endangered species is particularly high in areas of intensive economic (and particularly agricultural) development: southern Ukraine, southern Russia between the Volga and the Don, the deserts located south of the Aral Sea, and the southern Far East.